Well, although I promised to get back into the weekly blog routine and it's been two weeks since the last blog, I've only half failed. But only because I didn't actually attend the club this week. I have to get up super early for work on Tuesday so I only manged to nip in and take a couple of photos. Anyway, last week I played Sea Of Clouds. Philip was exited to play after winning my a nautical mile last time we played. Unfortunately he wasn't so lucky this time with Dan coming in first place. 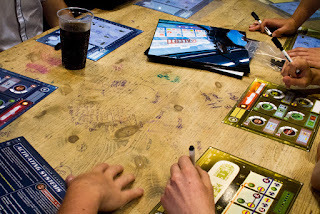 We also played Archaeology: The New Expedition and a few games of No Thanks! The big new game last week was Star Wars Rebellion. It got played four player with two teams of twos. It's quite a long game and, even though it was started at the beginning of the night, they didn't manage to finish it before closing. When I popped in the next week they'd set up the game where they left off and were finishing it off. This week the big new game was Captain Sonar, brought in by Danny. It's a kind of real time, team vs team game, kind of like Space Cadets: Dice Duel but with submarines instead of space ships. Forbidden Island, 7 Wonders and Machi Koro also got played as well as a bunch of other things that were played when I wasn't there.